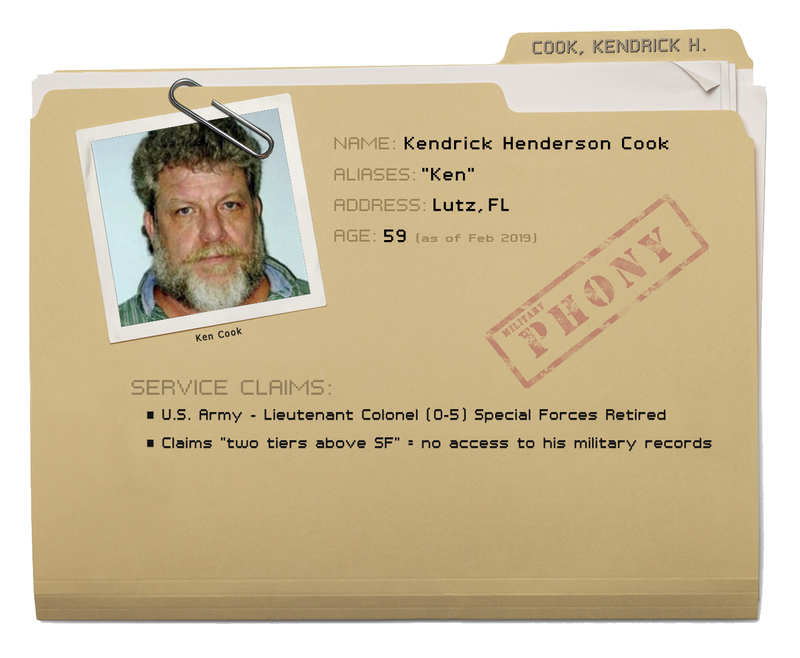 Kendrick Henderson Cook – who more commonly goes by “Ken” – comes to us from Lutz, Florida. He is 59 years old as of February 2019. 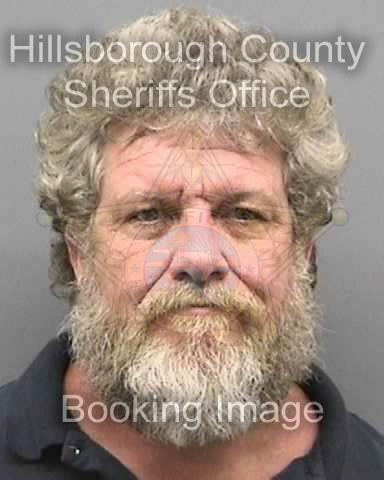 In addition to others making the request, Ken Cook’s military records were ordered through a Freedom of Information Act (FOIA) request. No training in Nov ATRRS (Army Training Requirements & Resources System). It shows any and all training going back to 1984. It allows you to see if a guy even attempted a course. It shows Cook was a PT recycling in the Q-COURSE the first time and then a drop the 2nd. Nothing at NPRC or the VA that would back his LTC claim. Two FOIA requests were sent with the same result. That’s why Cook can’t say his records were lost. He has ZERO ATRRS footprint. So he had no official training while with the 11th or after. NPRC can lose everything and that wouldn’t effect ATRRS. 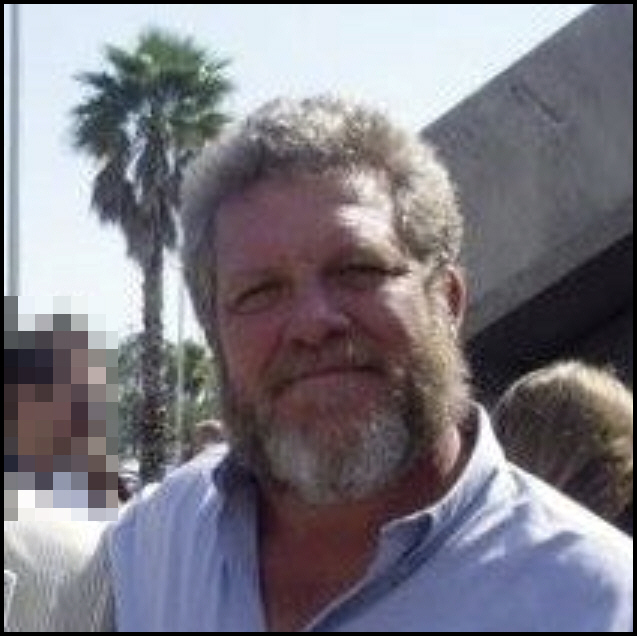 If Ken Cook was commissioned, he would have OBC or BOLC, career courses, etc. No way he got to O-5 without them. No way his post 93 training just disappeared. He’d still have to come off the DASR when he got out, so there’s no “secret squirrel” crap to pull. On his ATRRS… It has ZERO footprint. That would suggest the fact that after he ETS’d in 1982 and then joined the 11th in 1991, he never really had any additional training because ATRRS goes back to 1984 and his footprint is ZERO. The big question here is – what was Cook doing after 1993 when he left the service with an enlisted rank? Was he part of some sheep-dipped CIA/FBI profile washing program before being granted an O-5 officer rank in some secret clandestine service? 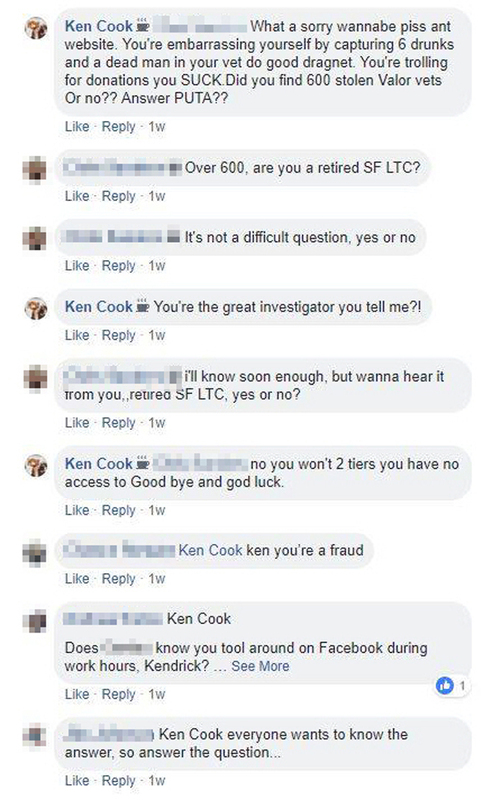 Ken Cook was questioned about all of this on Facebook. He took several directions, with one of the first suggesting that the access to his records are restricted and one must have two or three levels of access to get to them. When records were in hand, proving they could be obtained, Cook was approached again… this time softening his stance a bit and suggesting there is a “dark vault” of records on “Tier One” individuals. Then, the ‘Lieutenant Colonel – Retired’ reference disappeared from his Facebook profile and he was asked about it. He changed direction to one of making a mockery of what he is claiming, this time a Hungarian Navy Vice Admiral. Perhaps to later say he was joking around about everything? Kendrick Henderson Cook went through the training to become a Green Beret. 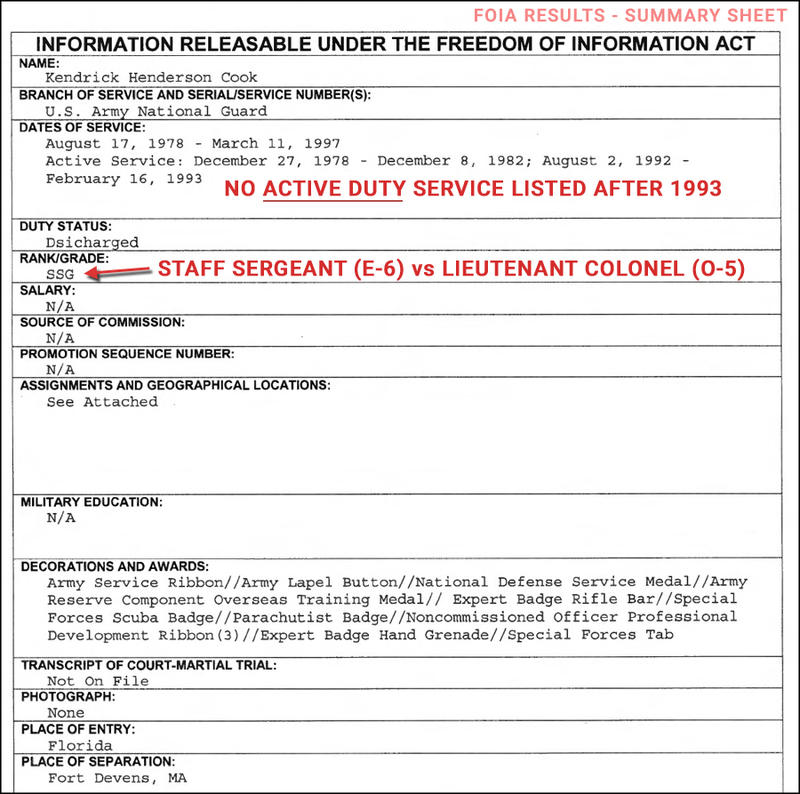 Cook’s official military record does not support his claim of him achieving the rank of LTC or Lieutenant Colonel (O-6). The record also does not support a claim of active duty beyond 1993. 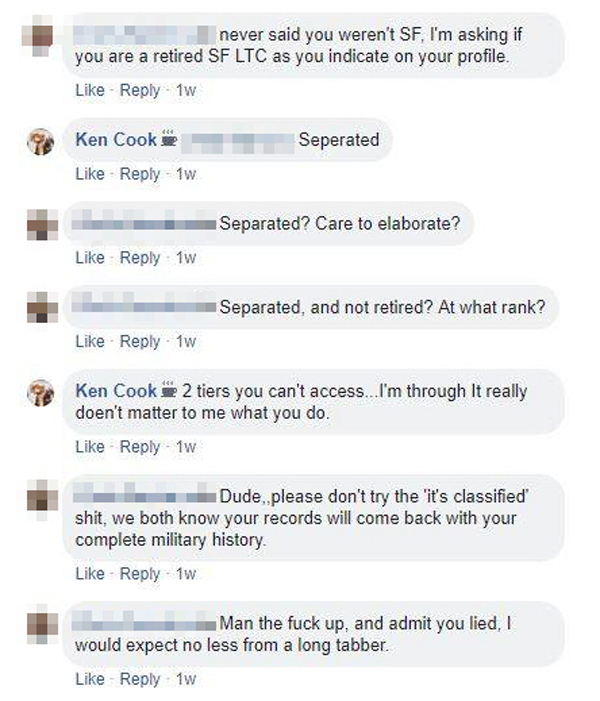 The official military records for Kendrick Henderson Cook do not support his claims of achieving the rank of LTC (O-5) and serving on active duty beyond 1993. 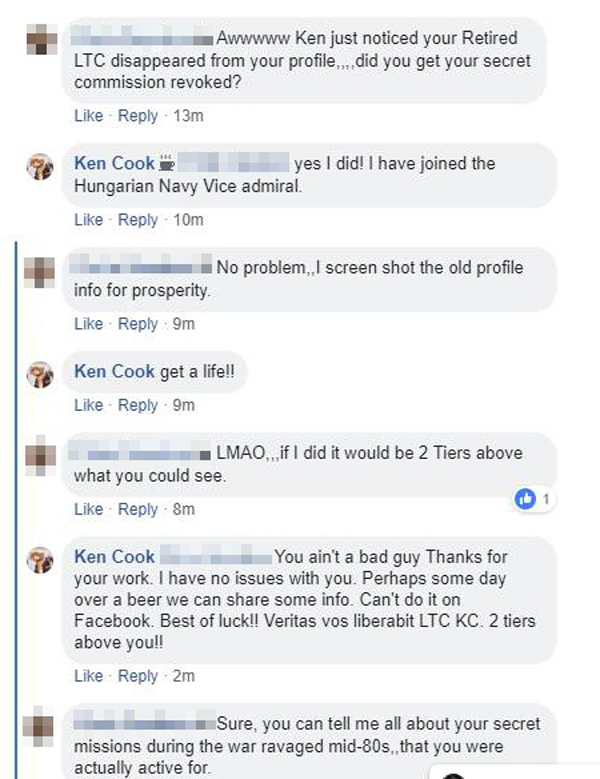 If these claims were leveraged by Ken Cook for something of value over the years, including monetary gain or work positions, Cook may be in violation of the Stolen Valor Act. Individual state laws may apply. Probably goes to all the local nudist resorts sporting his whatever rank he is!! I’m just glad all the mugshot collages I made could help! 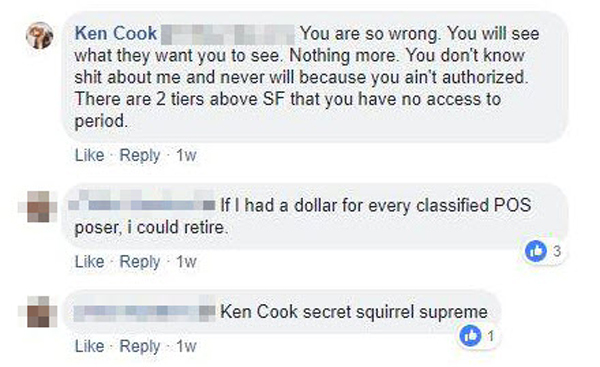 Lmao, Ken Cook – you’re welcome! 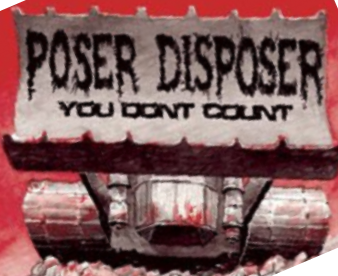 No guts no glory Ken cook just fade away loser . 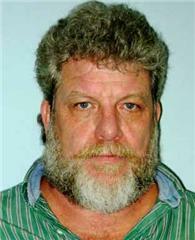 If he were a retired LTC, I’m sure he would be able to afford a haircut and get a razor and/or a beard trim. Two levels above SF is what, QD? Quack Dude? Ken Cook Your a total fraud and loser lowlife. I have a friend who is a retired Major ex enlisted up for Lt Colonel but chose retirement and a nice DOD Job he has a beard long hair and a Harley . Also Mr KC DD 214,s or 215s are not classified and are public record.